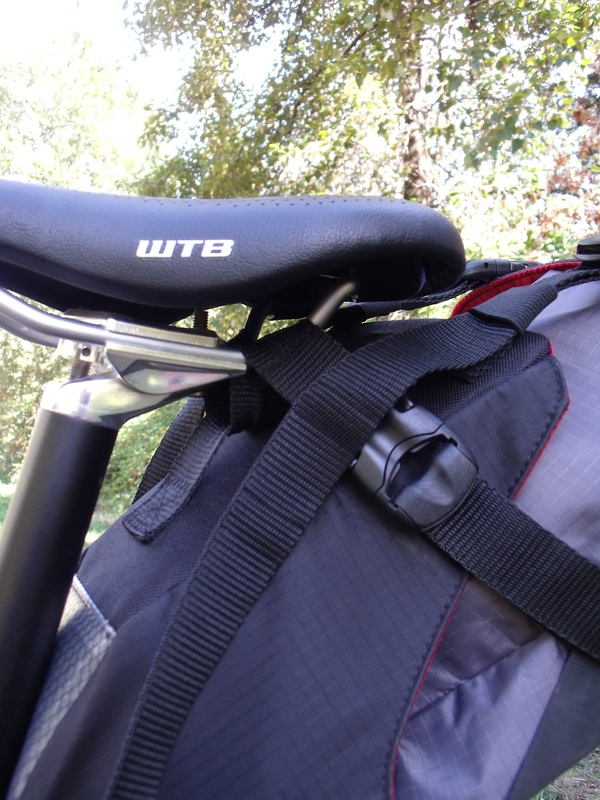 In the world of bike packing luggage a seat-pack is one purchase which many of us can put off for a good long while by using a dry bag strapped under our saddle rails and to the seat post. The internet is full of photos of different ways to do this, and readers who look back through the site will see I used a ~15L OR dry bag in the Chilcotins without issue, and again on a fat biking expedition to the same area. 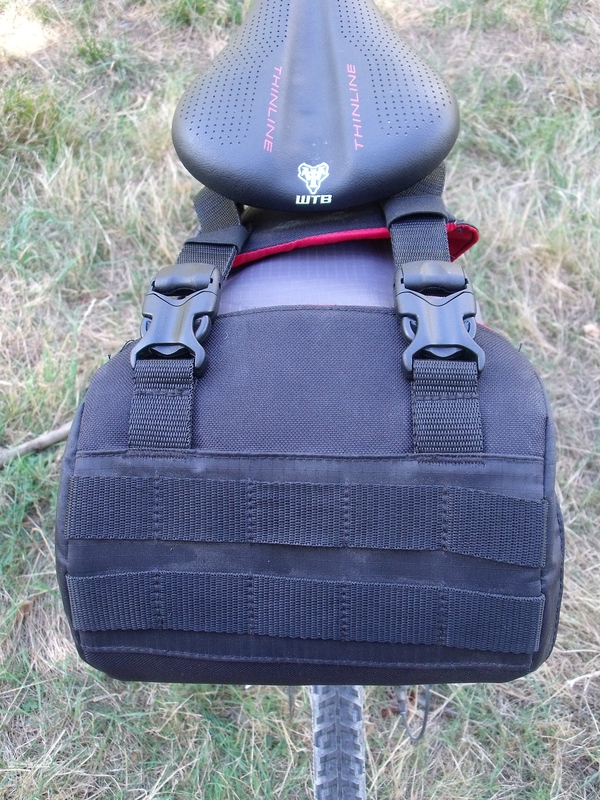 However for longer trips, to save wear on expensive drybags, and because they can be more stable for those riding more technical trails many bike packers do eventually turn to production seat-packs from one of the many companies catering to the bikepacking market. Between us here at Off Route we’ve ridden and tested the Porcelain Rocket Mr. Fusion (see photos here), the Revelate Designs Viscacha, numerous drybag setups, and I recently got my hands on the Blackburn Outpost Seat-pack. Much has been made in various bike-media channels of the fact that the Blackburn’s bike luggage is made in Asia. Personally that doesn’t bother me much at all. It’s great that more and more people are buying local gear, but at the end of the day I can’t afford very much of the domestically produced gear thats on offer, not to mention the fact that the market is full of domestically produced gear which is made to poor designs by frankly inexperienced sewers. With all this in mind, I jumped at the chance to pick up a seat-pack from Blackburn to give it a whirl. So how does the bike packing market’s middle-of-the-road budget option really perform? The materials of the outer harness are sturdy although the have a very stiff and heavy feel to them. Xpac this ain’t. 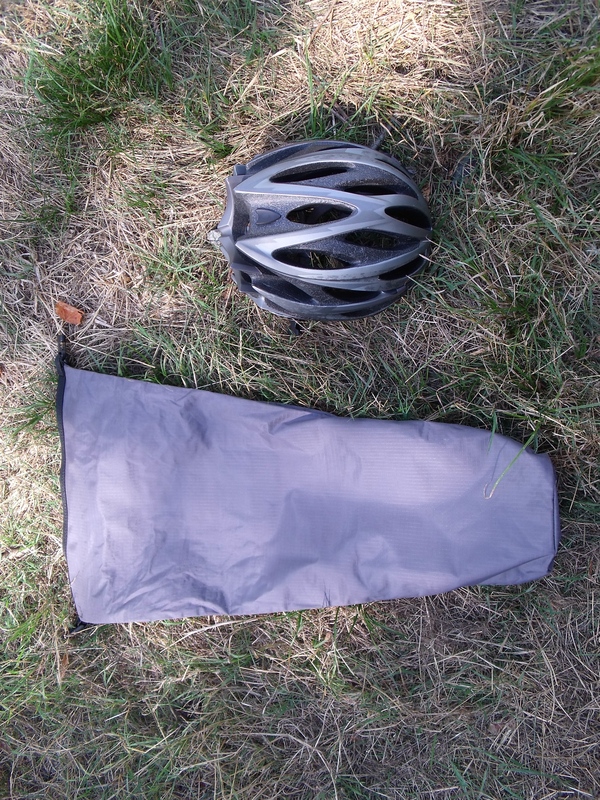 The dry bag is also made out of a very stiff and heavy weight fabric which irritated me a great deal when I realized the bag as sold is not in fact seam-sealed and therefore not truly a drybag. The webbing used feels robust but also cheap and while I’m confident it will last and wear well it definitely adds to the total weight of the system. The harness is very easy to attach and to adjust, the locking buckles adding to the feeling of security, and keeping any swaying under control. The twin velcro straps around the seat post are a nice touch and I can’t decide whether I like this or the Revelate Designs velcro more. The Revelate velcro feels better and makes a way cleaner strap, but the twin strap design actually seems to fit very nicely and I can strap one each above and below my seatpost collar. The shape of the harness narrows down a great deal towards the seat post which is good in the sense that you don’t have to worry at all about hitting your legs on it, but frustrating in that unless you take great care in how you pack it you end up with some dead air right at the front of the harness. The twin-strap closure system and the Molle style bartacking at the back of the bag are for me the real highlights of the Blackburn bag. 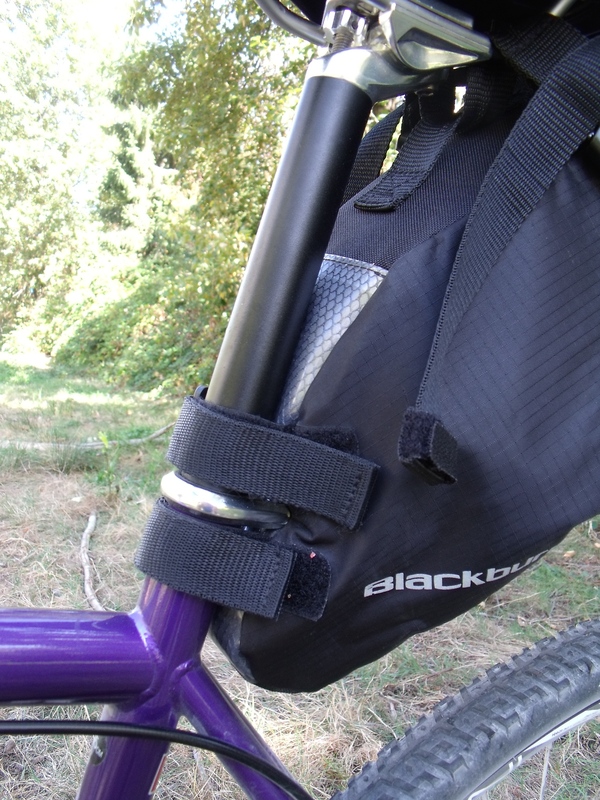 The bartacking is a simple and really effective addition that makes attaching lights and reflectors really easy and keeps them stable and visible while the two straps allow the harness to be overfilled but kept stable as well as allowing excess gear (or things like rain gear or wet towels) to be attached laterally really securely. Perhaps most frustratingly in the case of the Blackburn bags I think many observers assumed that the foreign manufacture would help to lower the price-point. While that is true to some degree, considering the lower quality materials used, there has still been (again – this is merely my opinion – and I’m entirely ignorant of the economics of these things) a pretty significant markup. In summary, it is an interesting entry into a crowded and rapidly growing marketplace. The design blends cues from a variety of other bag-designers into something that works really for me. 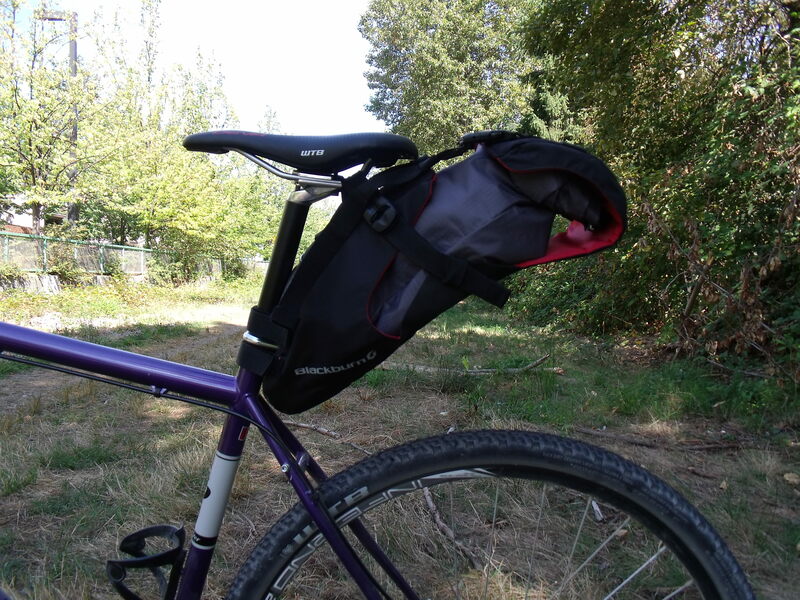 I’m a definite fan of the harness and separate bag concept, but I also appreciate the soft harness (as opposed to the bar used in Porcelain Rocket’s design) as it makes it that much quicker and easier to switch between bikes. Is it better than its closest direct competitor, Revelate’s Terrapin? I couldn’t say not having used both – but having used a Vicacha I think I can say pretty definitively the Revelate’s build-quality is higher (and it is definitely lighter! ), however I remain a fan of the Blackburn’s two strap closure at the rear. Check out the Blackburn Outpost Seat-Pack, and if you’re located in Vancouver wander by Mighty Riders to talk them into hooking you up. You can borrow my revelate terrapin if you want to make a comparison.